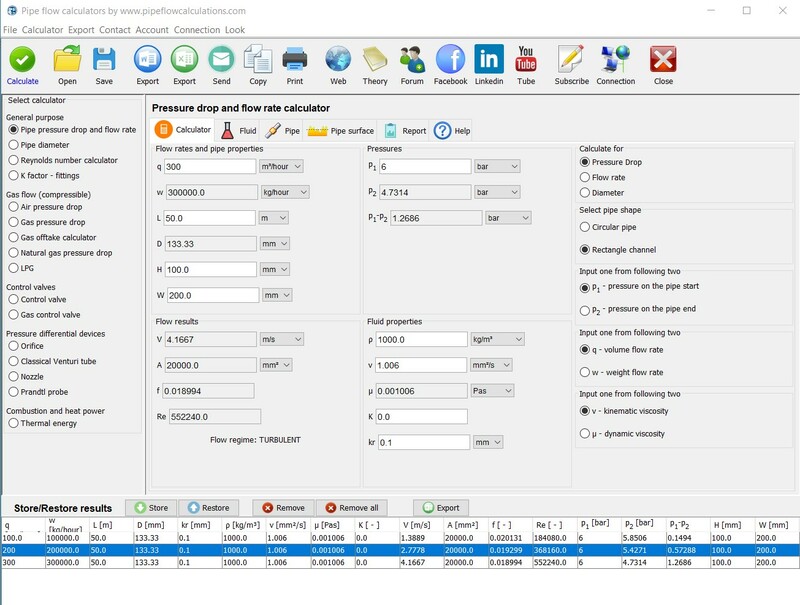 You can use pressure drop in pipe calculator for pressure drop and flow rate calculation for all Newtonian fluids (gases and liquids) with constant density (incompressible flow) in closed, round or rectangle pipe. If the flowing fluid is gas, pressure change due to friction, local resistances or height change has to be low (less than 5-10%) to be sure that this calculator is applicable and that it gives correct results. If the pressure change is higher than 10%, you should use the calculator for compressible gas flow. If you select gas as flowing fluid, the calculator assumes that gas has perfect (ideal) gas properties, i.e., the ideal gas law is applied to calculate any of the unknown gas state values - pressure, temperature or density. Pressure drop calculator is suitable for laminar and turbulent flow regime. Also, when it is not applicable? You can't use this calculator for compressible gas flow where the pressure of the gas is changing more than 5-10%. For that purpose, you can use one of available gas pressure drop calculators. You can't use this calculator if the fluid is non-Newtonian, i.e., its viscosity is changing with the shear rate or due to some other changed condition. Pressure drop calculator is not applicable if the flowing fluid contains solid particles or if the flowing fluid is the mixture of liquid and gas, i.e., multiphase flow. If the flowing fluid is gas but not a perfect (ideal) gas, i.e., if it's pressure, temperature and density are not related according to ideal gas law, this calculator is not applicable, also. If the viscosity of flowing fluid is changing due to flow temperature change, this calculator is not applicable as it takes viscosity as a constant value. What has to be known to calculate pressure drop? To calculate pressure drop, you have to know pipe properties - pipe length, internal pipe diameter and interior pipe surface roughness. For rectangle pipes, instead of diameter, channel width and height has to be known. For pipeline that has local flow resistances like bends, tees, reducers, valves, and alike, you have to know minor resistance factor as a sum of all individual resistance. Also, fluid viscosity (dynamic or kinematic) and density for liquids, or temperature and gas constant for gases are required. In the end, the flow rate (volume or mass flow rate) has to be known as well. What has to be known to calculate flow rate? The most important thing to know when you want to calculate flow rate - pressure on the start AND the end of the pipe, has to be identified. It is not possible to calculate flow rate if only the pressure at one point is determined. If at the end of the pipe is open air, then end pressure is atmospheric pressure. If not, the pressure on the pipe end must be known to calculate the flow rate. You have to know pipe and fluid properties also, to calculate flow rate in a pipeline. Pressure drop and flow rate calculation use the Darcy-Weisbach equation for head loss due to friction in closed, round or rectangle pipe. For turbulent flow, where is Reynolds number Re > 4000, friction factor is calculated using on the Colebrook and White equation (1937).